Are you looking for an easy Father's Day card idea? 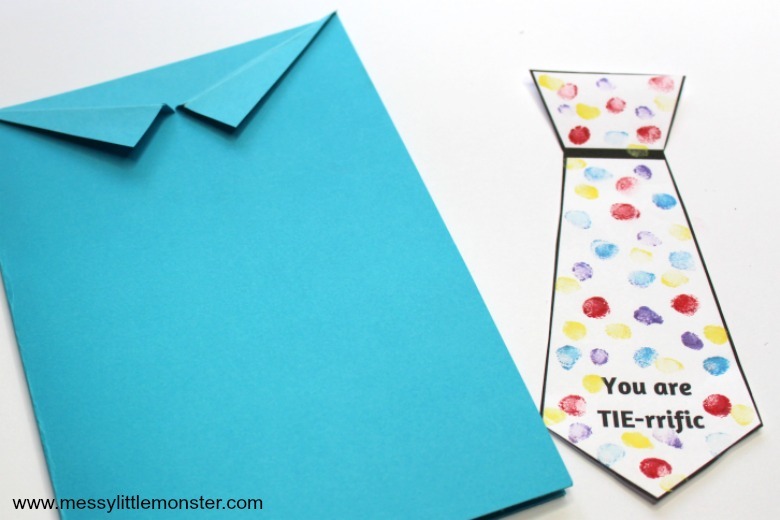 Making a Father's Day tie card is such a fun and easy Father's day craft that is perfect for toddlers and preschoolers to make for dad. 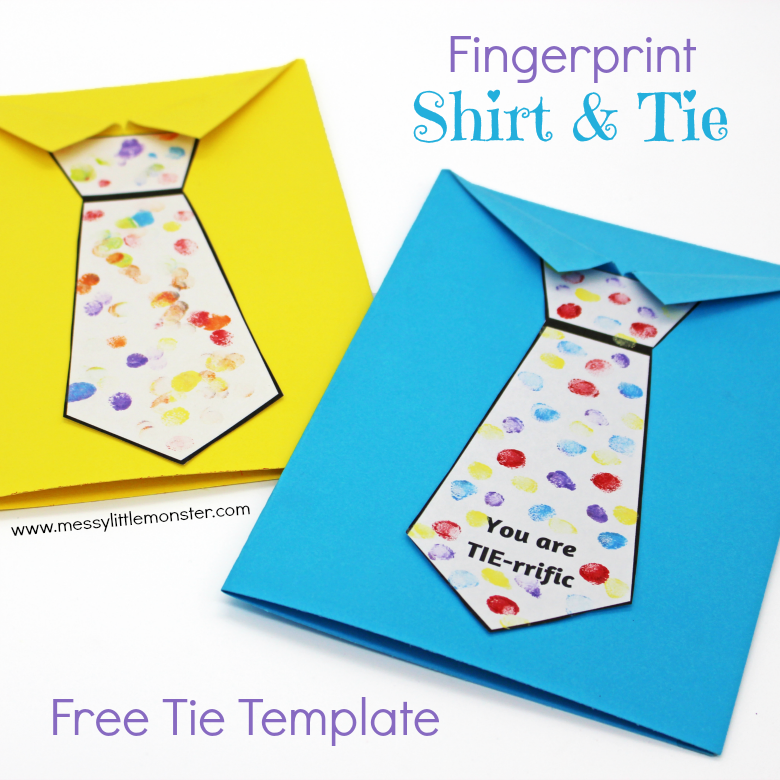 Kids can use their fingerprints or design their own paper craft tie to let dad know that he is tie-riffic! 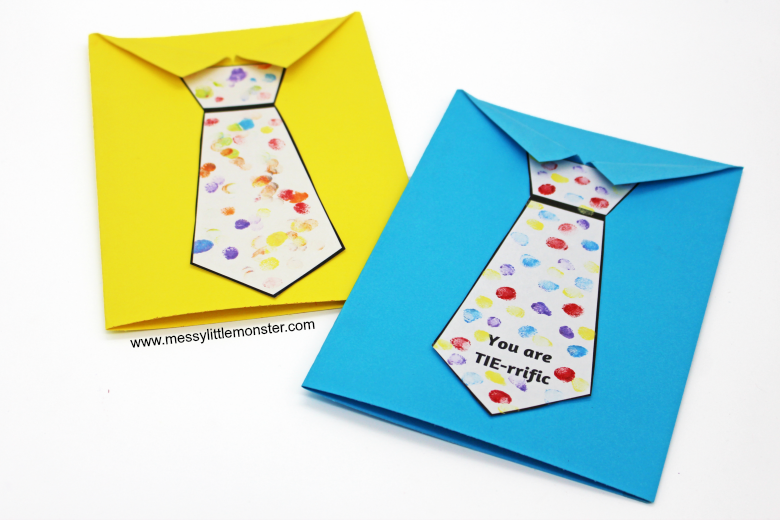 We have included a free printable tie template to make it extra easy for the kids to make dad this special tie card for Father's Day. Father's Day is the perfect time to let dad know how special he is. (Take a look at all our diy gift ideas for dad too!) Whether you are looking to make this tie Father's Day craft with one child or a whole group of children no two will look the same. Children can have free rein to design their tie however they please! We decided to use fingerprints to make our shirt and tie card. 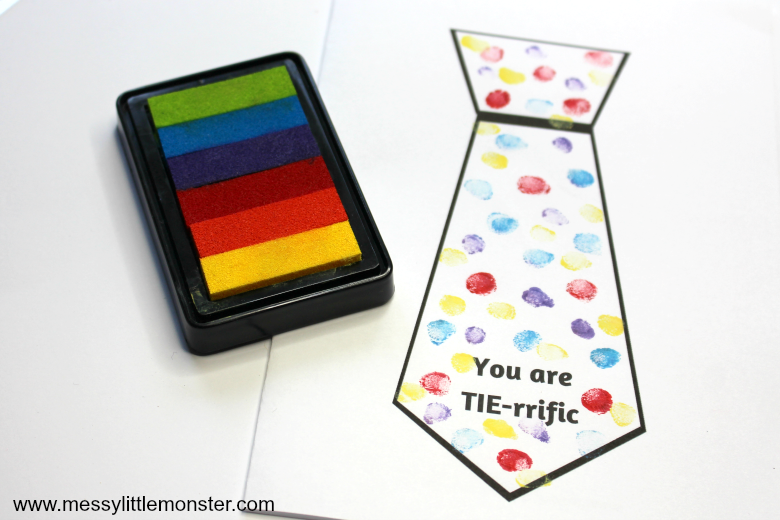 This is such an easy way for toddlers and preschoolers to decorate their tie template. Adding fingerprints also means dad will have a cute keepsake to treasure! Check out our other cute keepsakes kids can make too! Below you will find simple step by step instructions for how to make a Father's Day tie card using our free printable tie template. We have included the instructions for making a fingerprint tie, but let the kids decide how to decorate their blank tie themselves. You might like to take a look at some of our other Father's Day crafts. Our Father's Day handprint art that looks like dad is adorable and we have a set of printable Father's Day cards that are perfect to make last minute Father's Day cards. We have included a blank tie template for you to print out, you can find it by scrolling down below. We have two versions of the tie templates to print; one is blank for you to add your own design, the other has the words 'you are TIE-rrific'. Children can decide how they want to decorate their tie template. They could draw pictures, get out the paints or cover their tie printable with stickers! We decided to add fingerprints. Daisy (aged 3) enjoyed covering her tie template in rainbow coloured fingerprints. Decorating the tie with fingerprints is a perfect way to get toddlers and preschoolers involved in creating their own artwork as it is easy enough for even the youngest of toddlers to do independently. Older children might enjoy creating a pattern using the different colours. 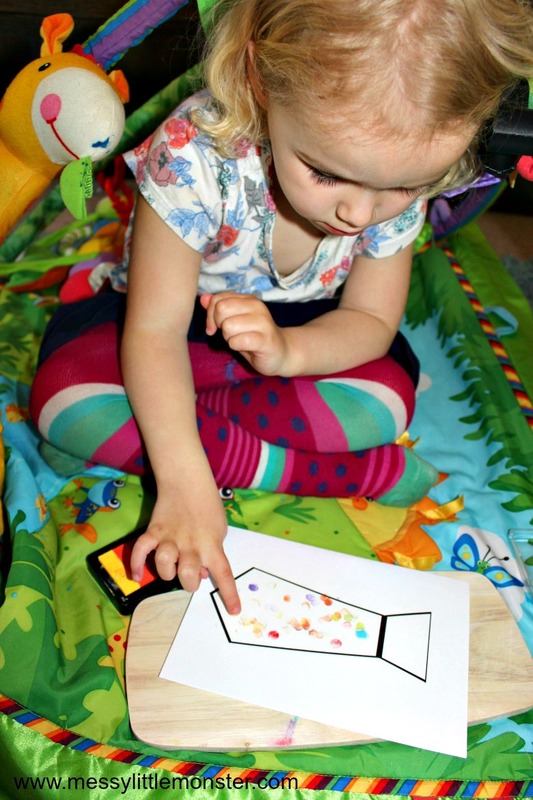 We used the rainbow ink pad that Daisy is using in the image above to make a butterfly bowl and card with baby Oliver a few weeks ago and Daisy has been desperate to do a craft where she can use the ink pad ever since. She even had to sit on Oliver's play mat while she did her artwork so she could be like him! Younger children may need a little help with cutting out their tie design. 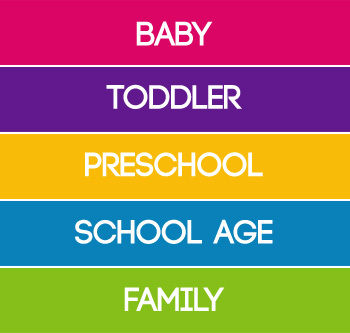 Older children should find it relatively easy to cut out as it only has straight edges. Cutting out their own tie would be great scissor skill practice for older preschoolers. To make the shirt fold a piece of cardstock in the colour of your choice in half. Find the middle of the front of the card and make a small cut at the top. 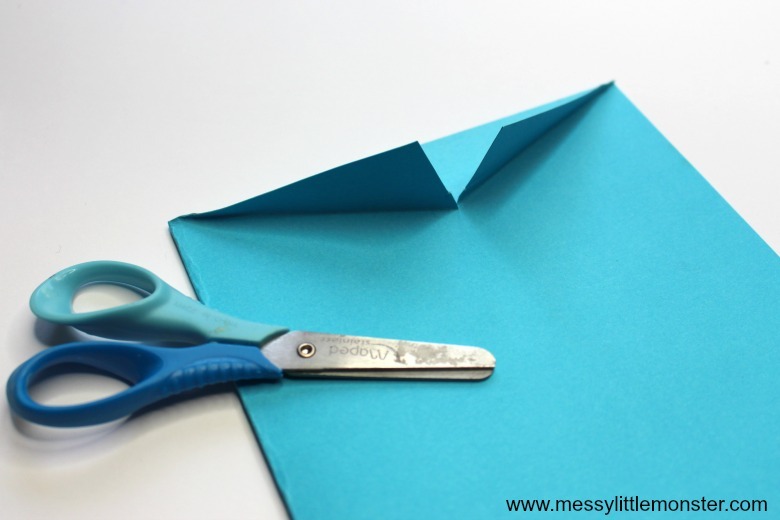 Fold the card down on both sides where the cut is to create 2 triangles. This makes the collar of the shirt. Make sure that the folds are pressed down well. To complete the card glue the tie onto the shirt. There we have it, how easy was that Father's Day tie card craft! 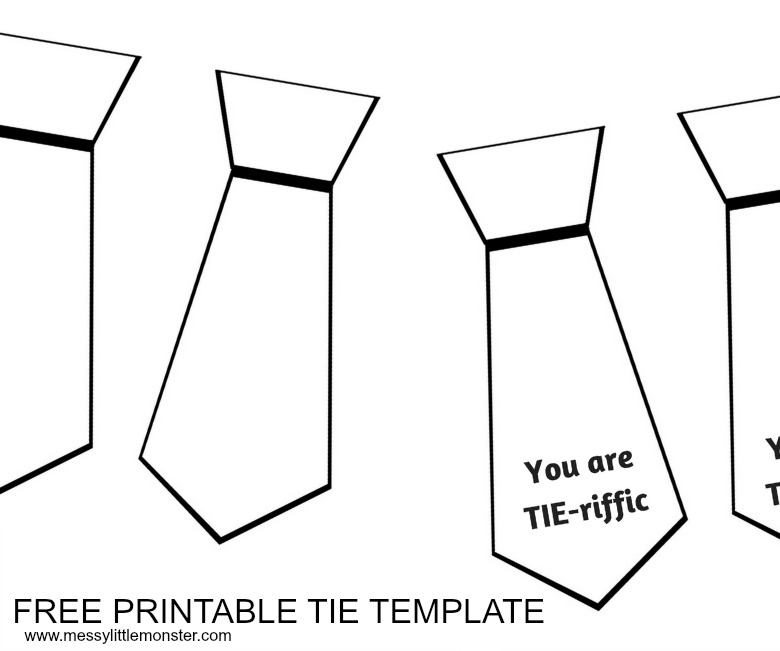 To download this tie template for free add $0 and click on the 'I want this' box below. It may take a moment for the page to load so please be patient. You might also like our other fun Father's day printables. I love the fact that this Father's Day tie craft is so easy for children of all ages. It can often be hard to find crafts that toddlers and preschoolers can independenlty work on. 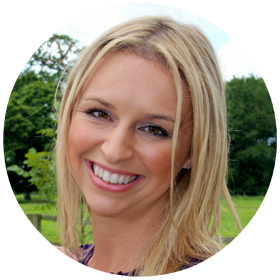 Whilst younger children will need help making the shirt the tie can be completely their own design. 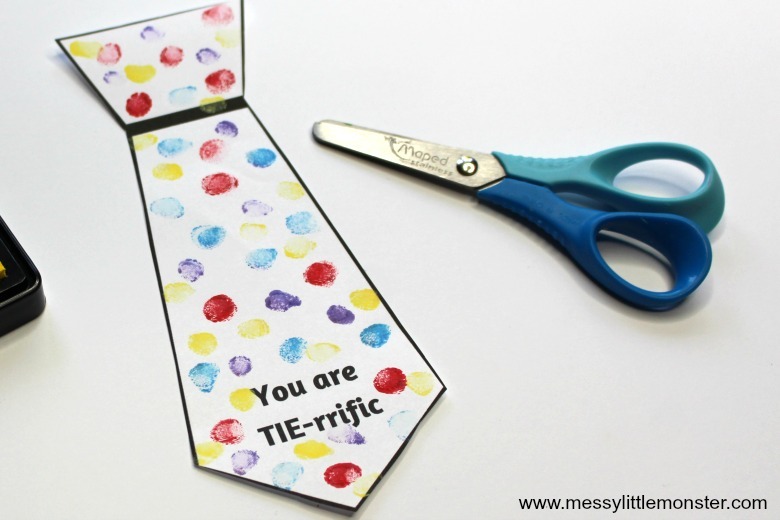 What a perfect way for toddlers and preschoolers to tell dad how TIE-rrific he is this Father's Day! 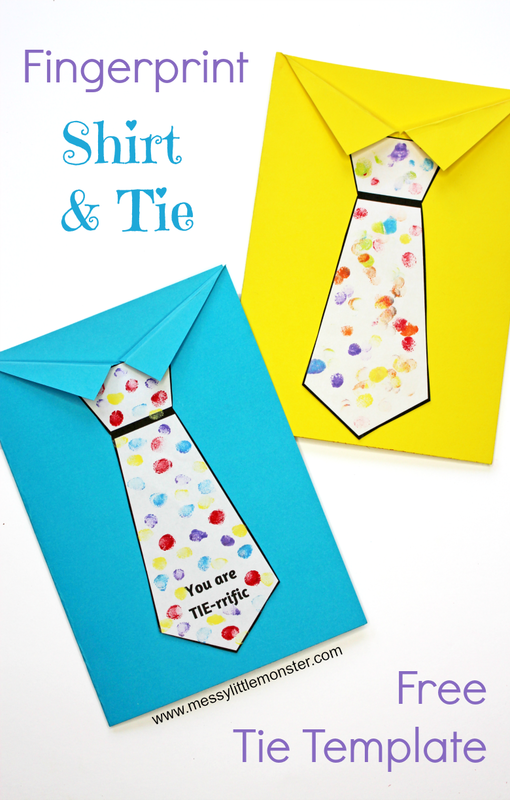 Why not make a diy gift to go alongside this easy Father's Day tie card? I love this handprint bowl and candy beer mug.